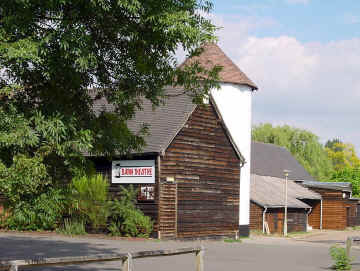 The Barn Theatre, Barn Close, Handside Lane, Welwyn Garden City - Theatre Shows and Live Music Nights. “Open Mic” live music nights are on the first Sunday of every month and we are shortly celebrating our 5th anniversary. Events take place in the bar or on the main theatre stage (from January 2005). Singers, either by invitation, or by booking in advance, can try their hand with a live band comprising professional and semi-professional musicians. The theatre bar also stages general live music nights, in the past we have had country bands, acoustic nights, jazz nights and many more. The bar is open to the public on music nights and is fully licensed. © Copyright Coda-UK 2005. All rights reserved worldwide.